With less than a week until its release, HipHopDX is offering up a brand new dose of Krizz Kaliko’s Kickin’ & Screamin‘ with “Can’t Be The Only One” featuring Tech N9ne. With a touch of classic R&B influence, “Can’t Be The Only One” features some prime bars from Krizz Kaliko and Tech N9ne as they partner up for another tale of come-and-go love. The brand new audio is the latest track to be featured from HipHopDX for the highly anticipated album that also includes guest features from Twiztid, Chamillionaire, and Rittz. 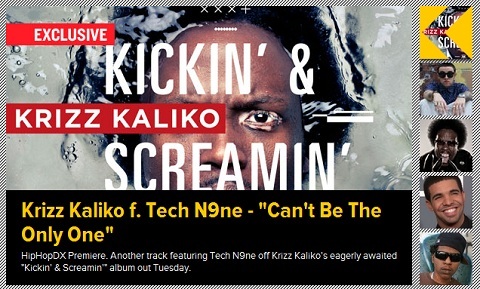 Check out Krizz Kaliko’s “Can’t Be The Only One” on HipHopDX and make sure you pre-order Kickin’ & Screamin’! Click here to listen to “Can’t Be The Only One”. What did you think of “Can’t Be The Only One”?